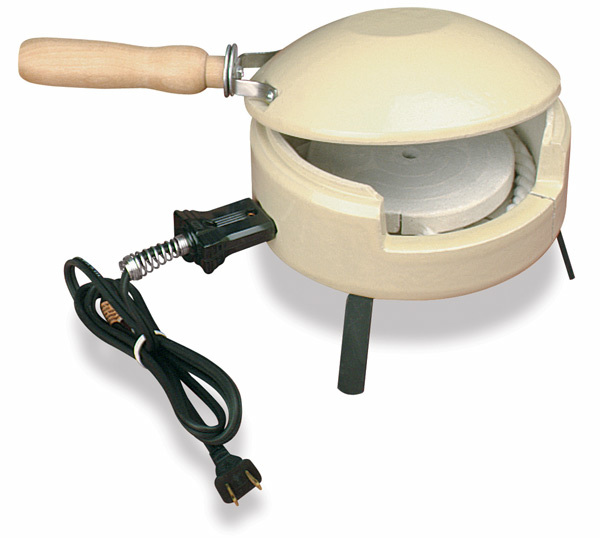 Economical and efficient, this kiln costs no more to operate than an electric iron, and runs on 100–120V household current. It reaches 1500°F (816°C) in about 15 minutes. Its 900-watt Kanthal wire heating element is embedded in a special refractory plate for extra protection. Amaco's Metal Enameling Kiln is constructed with a round, two-piece ceramic body that is glazed a light yellow. Its firing chamber is 6¼" (159 mm) in diameter. The lid lifts off for loading pieces of maximum size. Small pieces can be inserted through the front opening. Dimensions are 7¼" × 6¾" (184 mm × 171 mm). The kiln weighs 6¼ lb (2.8 kg).